Avatars hide and reveal at the same time. Behind it, people can conceal some personal things about themselves, but the avatar also selectively amplifies other aspects of their personalities. It may reveal something about the member that otherwise is not immediately obvious – maybe not even obvious if you met that person in real life. Maybe not even obvious to the owners themselves. What users express in their props is not always a conscious choice. Sometimes it’s unconscious. People may simply say that they are wearing a particular av because “I like it.” When asked, they’re not sure what it says about them. But other people may know. Yes there is a point to all this avatar talk. Online, one of the biggest ways people express themselves is with their avatar. Offline, the t-shirt is probably one of the most personalized articles of clothing for self-expression. Now, users can take their online representation and wear it around offline on a t-shirt, sweatshirt or other product thanks to a partnership between Zazzle and Zwinky. 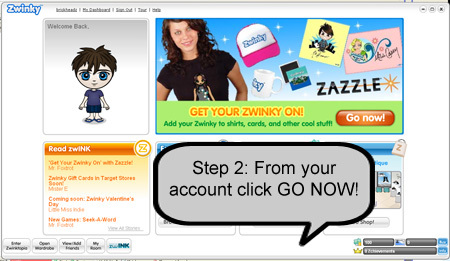 Zwinky is one of the biggest avatar sites on the internet. Zwinky is home to more than 12 million avatars and over 5 million users. From your account there is a large banner to get your avatar on products. Oh but wait, you can change your avatars clothes to make sure it is ready for the offline world! Once you have chosen your outfit you can then view your design on a variety of different products that of course includes t-shirts. Once again, Zazzle strikes a partnership that might really bring in substantial sales if those 5 million members are passionate enough about their avatar to bring it offline onto products. Source: Yahoo News/Press Release. You can also read more about it on the Zazzle Blog.